I decided to wait to start my tomato seeds this year until after I came back from the Texas Organic Farmers and Gardeners Association conference at the beginning of February. It seems like starting them in early February makes them too big when it comes time to sell them and they need so much attention when they are growing, especially when they are tiny, I did not want to be out of town at that crucial stage. I planted them on February 16th. I made a seed starter mix from 10 parts Coconut Coir, 2 parts Pearlite, 2 parts Vermiculite, and 1 part lava sand. I used my seed flats that have trays under them to hold water. The trick is to not let them get too wet or too dry. Too wet causes fungus and the attendant fungus gnats, and too dry makes them weak and can kill them. A lady at TOFGA said you should lift up on the trays several times a day to determine the moisture level. You can tell if it is somewhat heavy that it has enough water in it. If it feels light, then you need to add water. After you do this awhile you can get the feel of it and they will be happy. I also use heated seed mats which sometimes need to be turned off during the day. To heat the greenhouse I use an oil radiator heater when needed which is typically at night. The green house can also get too hot during the day. Mine has vents at the top and bottom that fan be opened to allow heat out. When it gets really hot, I hang a large box fan from the ceiling with the door open to blow out the heat. You should try and keep the temperature between 75 and 80 degrees. Not to hot or not too cold and not too wet and not too dry is the key. I also started sweet corn in the seed flats and will put them out after the last freeze. As if anyone knows when that will be. After the seedlings get 2 sets of true leaves I will step them up into individual containers and start feeding them. The tomato varieties that I planted this year are True Gold (yellow), from Seeds of Change. From totally tomatoes I planted Indigo Rose (grown in Austin and recommended by Texas Gardener Magazine), Mexico Midget (Marble sized), Tommy Toe (Australian hybrid), Sioux (Nebraska hybrid), Copia (Yellow and Red), Black Cherry, & Umberto (pink heirloom). From my seed stock I planted Cherokee Chocolate, Genovese Costoluto, and Purple Russian. I have grown all three of these for 3 years now and saved the seed. They have all done very well. I also planted eggplant, and various pepper seeds along with sweet corn that I will put out toward the middle to the end of March. The tomatoes should be ready to sell by the end of March to benefit the Greater Dallas Organic Garden club and the White Rock East Garden tour plant sale. Here's a concept that may be new to some. It is to me. 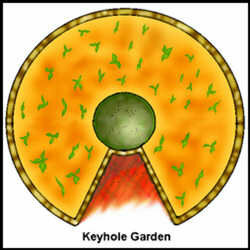 A Keyhole Garden is a raised bed, lasagna garden, composting, and recycling system all rolled into one. The design creates a garden that uses recycled materials, less water and maintenance, and can be made handicap-accessible. Whose Crazy Idea Was This? The keyhole gardens are the brainchild of humanitarian charities and missionaries for use in impoverished countries with poor soil, bad weather, and starving people. At least one organization teaches the schoolchildren how to construct the gardens from available recycled materials and to care for the vegetables. The schools then have nutritious vegetables for lunches. The children are encouraged to build a keyhole garden at home to educate their parents, thus enabling families to feed themselves. Advisers visit with the families to trouble-shoot garden problems. The Keyhole Garden concept is brilliantly simple. A circular raised bed has a center compost basket that distributes nutrients to the surrounding lasagna-style garden bed. 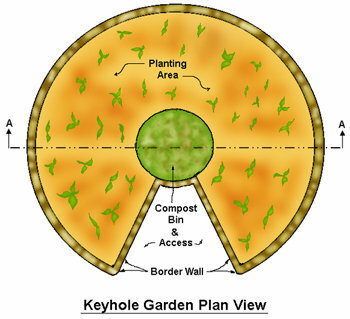 A small pie-slice section of the bed is used for easy access to the center compost basket forming the keyhole design (click the sketch on the left for larger image). Kitchen and garden waste, along with household gray water, are added to the center basket. The soil bed layers are slightly sloped away from the center to aid water and "compost tea" distribution. As the materials decompose, soil, composting materials, and amendments are added to the bed in later growing seasons. This is not a comprehensive how-to. 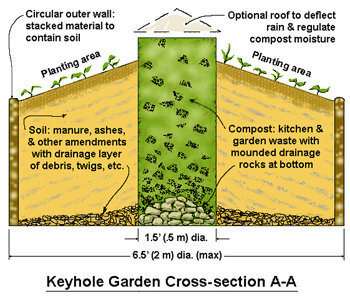 If you would like detailed information to construct a Keyhole Garden, please follow the links provided at the end of this article, otherwise, refer to the Cross-section View A-A at left (click for a larger image). The following is a list of recurring points made for the garden design to work efficiently. Use whatever materials you may have at your disposal that will allow the best result to be achieved. Drainage: Rocks, broken tiles or pots, rusty cans, twigs, small branches, or old critter bones can be used for the bottom drainage layer. Compost Basket: A tube, 1' to 1-1/2' (.5 meters) in diameter and tall enough to extend well above the center of the bed, can be fashioned from anything that will allow water to pass through into the surrounding bed like chicken wire, fencing, or sticks (think in terms of a woven basket). Supports to hold the basket in place, such as strong branches, boards, or rebar, and wire or strong twine to hold everything together, also, will be needed. Outer Border Walls: Anything that will contain the soil could be used: stones, bricks, or blocks can be stacked into place; boards or branches could be driven into the ground; sand bags or old tires could work as well. Planting Bed Fill: Use the same materials as for a lasagna garden, or compost pile, such as cardboard, paper, manure, leaves, straw, hay, old potting mix, or wood ashes, then finish the surface for planting with top soil. A cleared level area no larger than 6-1/2' (2 meters) in diameter is the maximum size for a Keyhole Garden. A larger diameter bed may suffer from a lack of water near the outer wall of the bed (from the compost basket), and plants close to the center may be difficult to reach. The cutout area of the keyhole should be wide enough to allow easy access to the compost basket when adding materials, removing compost, or making basket repairs if needed. Positioning the cutout on the North side of the circular garden would use the dark space of the bed that would not receive full sun, thus leaving all the sunny sides for planting. A roof can be made to deflect excessive rain from the compost basket or to conserve compost moisture during drought. Trellises could be installed to support cloches for weather protection. It’s time to start planning for our annual GDOGC plant sale. This is our main fundraiser and allows us to hold such nice events as the fall field trip and the garden tour, and to donate money every year to worthwhile garden-related ventures. How can you help? Start seeds of plants to grow at the sale. The sale will be April 12th, so it is time to get cracking! Here’s a how-to link for starting your own seeds: http://www.motherearthnews.com/organic-gardening/seed-starting-basics.aspx?PageId=1. Sources for interesting seeds range from Burpee to Baker Creek to Seeds of Change. The key is to provide enough light so your seedlings don’t get leggy before you can put them outside in the sunshine. Grow lights are inexpensive and easy to rig up-mine are in my garage on a very simple pulley so I can raise and lower the lights as needed. Another easy thing I have found is to use a circulating fan set on low to circulate the air. This prevents damping off. A warming mat is a great investment as well-the seeds sprout much more quickly and it allows me to start my seeds in the unheated garage rather than the house, where my cats would have a field day. I have had the same mat from Gardener’s Supply Company for TWENTY years. It’s not pretty, but it works just fine. I use the mat to sprout a few flats of seeds, then rotate new flats onto the mat to sprout them. Eventually they are all uncovered and hardened off to the outdoors. I find my biggest challenge here in Texas is protecting them from the very fickle weather-one bad storm can wipe them all out. Finally, capillary matting also helps a great deal because it keeps the soil perfectly moist as long as you just keep even a little water in the reservoir. See http://www.gardeners.com/Seedstarting/Seedstarting_Dept,default,sc.html for more information. I also clean and reuse the capillary matting and it works for multiple years as well. At the sale we find vegetable transplants and herbs sell very well, in addition to annuals and perennials. Once we get a little closer to spring, consider dividing and transplanting plants and bulbs, and dig up any little “babies” that pop in your garden. I find there are always a few new Turk’s Cap, Rudbeckia, and other perennials to share from my garden. Please help us have the most successful sale ever!